Although officially man made, the reservoir at Dillon is more affectionately referred to as "Dillon Lake" located near Frisco, Colorado. 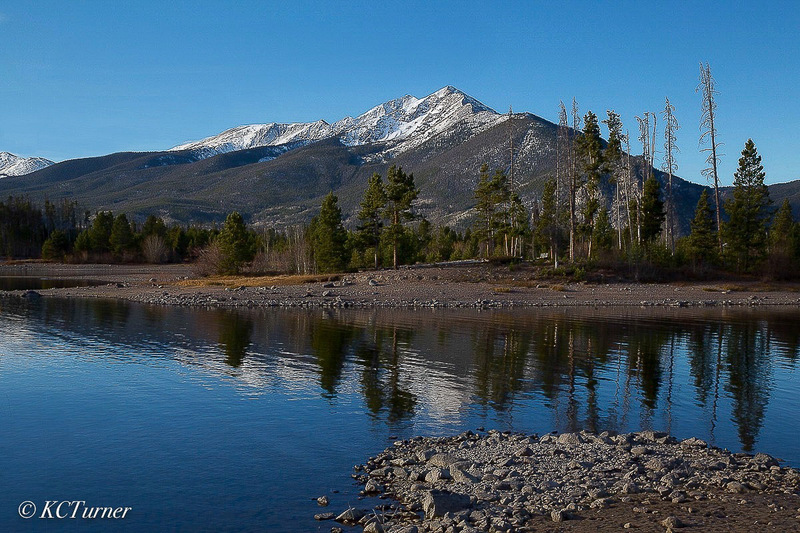 This photograph combining both lake and landscape, framing Quandary Peak looming in the background, features a "Blue Bird" skyline and reflection. Plenty of picnic and hiking areas too! Photo © copyright by K.C. Turner. This mounting option is by far the most popular format. My Plaque Mounted (Ready to Hang) prints bring out a clear, realistic, dimensional impression by using a fine art ink print which is mounted on an ECO-friendly, HDF wood substrate backed with concealed French cleat hanger to give it a floating effect when mounted on the wall. It is then sealed with a satin semi-matte UV coating which eliminates reflections and protects the print that can then be cleaned with a soft damp cloth. Modern, stylish and impactful. My Acrylic-Glass Mounted (Ready to Hang) prints are formatted using a fine art Metallic (“Glossy”) Print to add extra depth and iridescence for a remarkably modern presentation with the front face being finished with a beveled edge. A protective, acid-free black coating is applied to the back of the acrylic face-mounted print and completed with a black 0.5” recessed backing with concealed French cleat hanger to give it a floating effect when mounted on the wall. This presentation is super smooth and ultra-glossy, enhancing the image and all the details. Impressive indeed! Using a high grade, 1/8” ECO-friendly wood based product coated for moisture resistance and longevity, these Canvas (Giclee) Gallery Wrap (Ready to Hang) prints are made using direct printed, UV cured inks that can be cleaned with a soft damp cloth. The canvas prints are wrapped around a solid box frame with 1 ½” thick edges finished off with image mirrored sides. This option comes ready to hang with wire hanger installed. I am happy to offer this “Purchase Print Only Option” to those who would prefer to buy one of my Archival Fine Art Prints which you could frame yourself or take to your favorite shop for framing. This option is printed on Fuji Crystal Archive Paper with a Semi-Matte finish that virtually eliminates distracting reflections. The print ships to you flat, mounted on a thin, sturdy backer board to facilitate whichever choice of display (and/or hanging/framing) that you apply, including framing without a mat or glass. All material © copyright by K.C. Turner/Media Engineering LLC. All rights reserved. Site by WideRange Galleries.